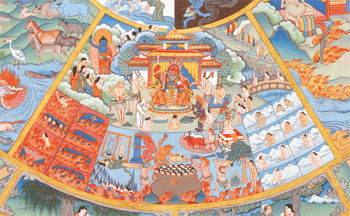 The suffering of suffering or blatant suffering includes all the miseries of the lower realms, as well as the sufferings of birth, old age, sickness and death in the higher realms, and also separation from what we hold dear, having to encounter what is undesirable, and not achieving what we want even after pursuing it. All these types of suffering, big or small, are undesirable from the very first moment they appear, and are therefore understood to be painful. There are countless different categories of suffering, as we can appreciate if we consider even just the hot and cold hells. Note: According to the Abhidharma-samuccaya, separation from what we hold dear, having to encounter what is undesirable and not getting what we want are all included under the ‘suffering of change.’ There is no contradiction however, since in that text they are explained as if they had not yet occurred, but are bound to be experienced at some time in future; whereas here we are speaking about what it is like when we actually experience separation from what we hold dear, encountering something undesirable and not getting what we want. The suffering of change means that no matter where we find ourselves, whether in this world system or any other, even if we are in the higher realms, and no matter how seemingly pleasurable and attractive our dwelling place, physical body or sensory enjoyments, our situation can not possibly remain as it is, but is bound to change, because of not being beyond the laws of impermanence. When it does change, what was previously a pleasurable experience becomes a source of suffering. It is just like the sorrow caused by the death of a child: it is because we were so happy when the child was alive that their death is so painful. The suffering of being conditioned refers to all experience that is bound up with the ordinary psycho-physical aggregates, or skandhas. No matter whether we are experiencing temporary pleasure or suffering, or even a neutral state, we are always setting ourselves up for future suffering. Why? Because our present skandhas are direct causes for our future skandhas, which will be the supports for suffering in the future. That means all our present experiences are in some way the causes for sufferings that will come to us later on. It is as if all our meals have been laced with poison, and as we eat and drink we are unaware of the suffering and pain that is to come. Mingyur Rinpoche, Joyful Wisdom (New York: Harmony Books, 2009), pages 50-58. This page was last edited on 18 January 2019, at 14:24.